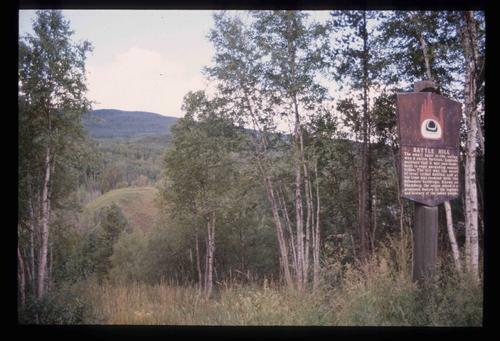 Image depicts the Battle Hill National Historic Site in Kitwanga, B.C.. The sign located there says: "The small knoll in the valley was a native fortress. Legends maintain that it was man-made: built to repel marauding coastal tribes. The hill was the scene of local tribal battles, and at one time was crowned with the defenders' buildings. Known as Dhawdezp, the unique mound is a prominent feature in the legends and history of the Indian people."